I have a tip that is too projecting and a bump at the top of my nose after rhinplasty 4 weeks after. Results are hard to judge early after a Rhinoplasty. During the first month, swelling that occurs differentially over the nose can present results that are less than desirable. This can occur due to multiple reasons. Bleeding in one area over the nose more than others can lead to contour changes that will most of the time resolve. Manual shaping can be important part of the post operative care for the rhinoplasty patient. This can also make the nose look less straight as well from the front as well as the side. Your surgeon should know the best. The crooked nose or deviated nose is one of the most complicated procedures to do in rhinoplasty and requires most all of the skills in rhinoplasty that your surgeon will need to have in his skill set. The small hump at the top could be a localized area of swelling from bleeding and could use some massage. Your physician should help you through this stage. Here is a before and after of a person who had a small hump and also a tip that was too projecting and turned down. 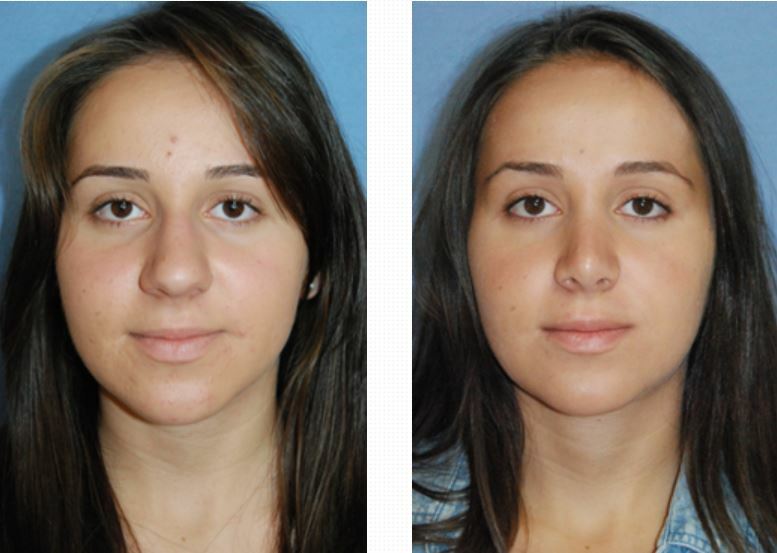 You can see more Rhinoplasty Before and Afters here. This entry was posted on Wednesday, December 15th, 2010 at 8:52 am	and is filed under Rhinoplasty / Nose Surgery / Nose job / Nose Reshaping / Nasal Reshaping. You can follow any responses to this entry through the RSS 2.0 feed. Both comments and pings are currently closed.